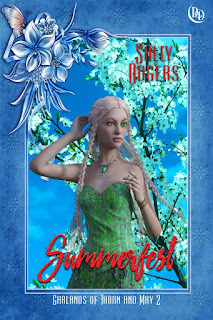 Summerfeste was published on January 4th 2019, making it my first book for the year. Summerfeste is the second of three books in the Garlands of Thorn and May trilogy. In the first book, Thornfair, Rowan Amhill, who loved the old ways, met a hillfayre who asked her for milk. Rowan, full of romance, charm songs and ballads, was willing to give Flynt dan Apfel a lot more. His people were declining and, since they no longer mingled blood with the Hillgift villagers, they would soon be gone. Rowan obtained a promise from Flynt, but she failed to keep it. She was determined to get another chance. Summerfeste takes up the story some time later when Rowan is prepared to go to desperate measures. Her childhood friend Ashwin is the main character in Summerfeste and he tries to sort out Rowan's problems while dealing with several of his own. Ash considers himself a plain and unlikely prospect for any woman, but he finds himself sought by three of them. That would be flattering is he didn't doubt their motives. Like Thornfair, Summerfeste was born of my abiding interest in hollow hill fairies, and my fascination with good intentions gone bad. Thornfair is set in the springtime, with the hawthorns flushed with green and covered in blossom. In my mind it's a green and white book (and I'm not referring to the cover). Summerfeste is a golden brown book, with the gold of corn, the rusty shade of bracken and the brilliant yellow of gorse. This is high summer, but despite the beautiful days, the bitter results of Rowan's promise will have their way. Book three will be called Crossover. I wonder what colours that one will bring? You can buy Summerfeste HERE and check out the home page of the trilogy HERE.